John Gonzalez and Amy Sherman are co-hosts of "Behind the Mitten," a podcast about Michigan beer, food, festivals and the people who make it all happen! Today's episode (Feb. 5, 2015) finds Amy and John in two different places. John records with Paul Starr of I'm a Beer Hound at Sleepwalker Spirits & Ale in Lansing. 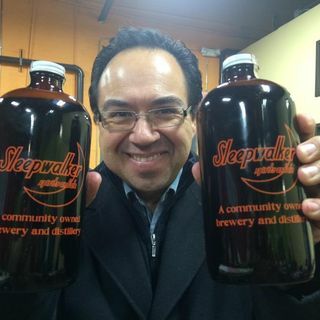 They run down the weekend's biggest events, and also spend time learning about community-owned Sleepwalk from co-founders and brewers Matt Jason and ... Maggiori informazioni Jeremy Sprague. Amy then heads out Schmohz Brewery in Grand Rapids to interview brewer Chas Thompson. It seems his team the MI Ice Guys have been named members of the USA Ice Fishing Team. They will be traveling in March to compete in the World Ice Fishing Championships XII. As a fundraiser, Schmohz will be hosting Fish Frys every Friday in February from 5-8 p.m.